October is already half-way over, but there are still plenty of events scheduled for locals and visitors on Edisto Island. The Edisto Fall Festival will be held from 11 a.m. to 4 p.m. Oct. 20 on Jungle Road. There will be arts and crafts, vendors of all kinds, and children’s activities. This yearly festival is always the third Saturday of the month. Children are welcome to come out to Trick or Treat at the Creek, which is a yearly event sponsored by the Town of Edisto Beach. The event will take place at Bay Creek Park next to the marina. There will be a costume party, games, prizes, and tables set up for trick-or-treating. Contact the town at 869-2505 for more information. The island’s breast cancer awareness groups, the Edisto Belles, are hosting the Bridge Walk for Breast Health Awareness at 9 a.m. Oct. 27 at that McKinley Washington Bridge. Check-in for the walk is at 8:30 a.m. and the walk begins at 9 a.m. The fee is $10 per walker. Register in advance by contacting Mott Parker at 869-4319 or at mottp@edistobelles.com. On Halloween night, McConkey’s will host its second annual Halloween Costume Contest for kids and dogs. The event begins at 5:30 p.m. and is for children ages 0-12. McConkey’s is also having a costume drive for children on the island, so if you have any new or gently used costumes to donate you can do so by dropping them off at the restaurant. 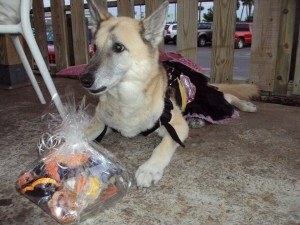 The dog-portion of the event will be at 6:30 p.m. and the best-dressed dog will receive a prize. Check back soon to read about more events as they crop up. Edisto Beach is such a nice place where we can also go with our love one..I also went this place with my husband in last month to celebrate our honeymoon..This is really a fabulous place,we both were doing a great fun at this lovely place..So thanks for this post..!! !